LAS VEGAS -- In this year’s SAP TechEd keynote speech, Chief Technology Officer Vishal Sikka stuck to a line he’s been toting for the last couple of years -- delivering innovation without disruption. But this year, he provided some more detail on what that actually means, including SAP’s plans to enhance the existing NetWeaver platform and deliver “new horizon” products, as he termed them, based on cloud computing, mobile and in-memory technologies. Attendees got the first glimpses of the Gateway initiative that powers Duet Enterprise and an idea of how the HANA technology will fit into their landscapes. In this interview, Sikka provides more detail around these initiatives, including SAP’s cloud strategy and Amazon EC2’s place in SAP’s on-demand efforts. 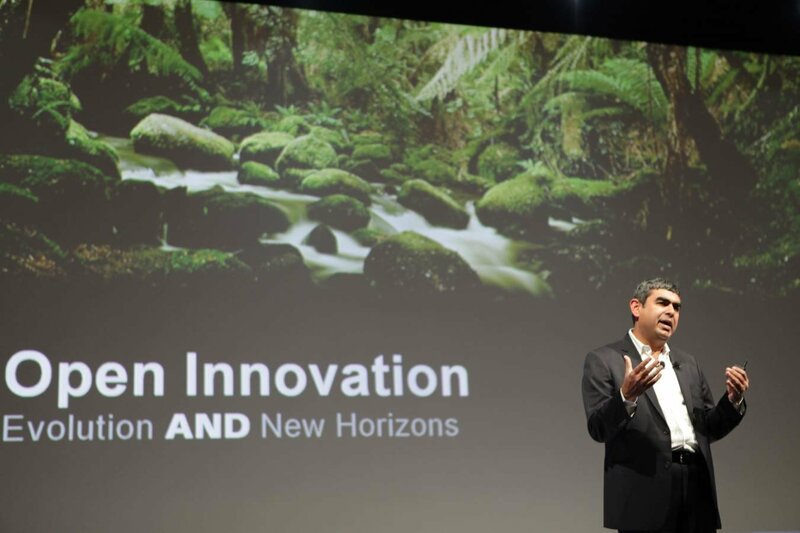 SAP CTO Vishal Sikka discusses "new horizons" during his TechEd Las Vegas keynote. SearchSAP.com: Can you talk to us about the River platform? Vishal Sikka: For the large enterprises, for the foreseeable future, there will be the on-premise systems that they will continue to run. Mission-critical applications are not going to move to the cloud any time soon. People will instead move them to these private clouds so that they can more easily bring the benefits of cloud infrastructure to these, but they will continue to own their dedicated landscapes. These on-premise systems are to be complimented by cloud applications. Some of these are complex cloud applications (line-of-business applications, such as sales-oriented or support-oriented functions) that we deliver by the mass. These applications we will build on the Business ByDesign application platform. But then, every time you build an application, there’s a need to extend it, to complement it, to add your unique differentiations to it and so on. For that we have built a platform called River; we haven’t launched it yet, however we have built an application on it that is in the market -- Carbon Impact. This runs on the Amazon cloud, and it is a perfect example of a simple, lightweight collaborative application that runs in the cloud that basically complements an existing mission critical system, in this case, the R in ERP. These applications are lightweight, they are collaborative -- StreamWork is a perfect example of something we will move to River. They are networked. You could build a complementary application that not only extends an existing suite, but it could be an application that connects suites across companies. This is one of the things we are thinking about, to build a networked application in the area of sustainability. SearchSAP.com: Carbon Impact runs on Amazon EC2. Will other SAP applications run on EC2, and how did you, and will you, decide this? Sikka: We have been working with Amazon since the fall of 2006, and most of the work was around how you could run mission-critical applications on EC2. For a variety of reasons, this doesn’t work. We have been working on this, and we have a great partnership with Amazon, for the last four years. What does work is for mission-critical applications, like financials and so forth, that customers run those in the development and test mode on Amazon. We have hundreds of customers that are doing this; we actually have a product that we have built to let customers run their development and test landscapes on Amazon. But not the production landscapes; nobody is ready. Not because we don’t want them to but because they are not ready to run their mission-critical applications on EC2. So when we looked at Carbon Impact, this was a perfect example of a simple application that you could run on Amazon EC2. Why did we choose Amazon EC2? To a large extent because we wanted to; I wanted to run something on EC2 in production. We actually negotiated with Amazon some of the things that they don’t normally do around protection of data, around integrity of data. Because this is carbon data, and large companies, one of the embarrassing things in the Carbon Impact application is the usage of corporate jets. Companies are a little bit reluctant to put the corporate jet user data in the cloud. So we worked with Amazon above and beyond traditional support to protect the data, to maintain the integrity and the service levels and so forth. Will we continue to run our applications only on Amazon? No … A certain class of applications makes sense to run on EC2 … (But) We will run the cloud applications on a variety of clouds, including our partners -- T-Systems, Microsoft, HP and IBM; every one of them has a cloud strategy, and we will work with all of them. We will also run them on our own cloud, where Business ByDesign runs. The reason for that is, at a certain scale, it is easier for us to provision and manage and optimize the experience having our own cloud. SearchSAP.com: So the strategy here will be similar to SAP’s hardware “agnostic” strategy now. Sikka: It’s the same thing. Three years from now you will be asking me, how many clouds are you supporting? SearchSAP.com: Can you provide us with some more details around Gateway? Sikka: To take a 4.6c application, with all customizations and to have it speak with the world of SharePoint or the world of Facebook or the world of Twitter or anything new that comes along, is not straightforward. You need a way to enable that existing system to speak that new language. And you could enable that in two ways. You could go and tell the customers that you upgrade to this new software that is already enabled. Or, you could go and tell them that we have built a Gateway system that acts as a bridge. Gateway is that bridge from the existing system to the new world. I find it very surprising when people get confused about the Gateway and the Sybase Unwired Platform; they are totally different things. One is a mechanism to enable an existing system that is dark to the outside world, and to put windows on it. The other is a platform for building mobile applications. In some cases you need both; in some cases you need one but not the other. Duet Enterprise is a product we have built with Microsoft that has the Gateway inside it that has the abilities to connect the world of SharePoint. SearchSAP.com: Will ECC customers use “the Gateway” as well to connect to SharePoint, etc? Sikka: Even though in ECC, we have 3,000 enterprise services, the enterprise services are usually large, and they are designed for process consumption, not for UIs. UI are not there, the SAP data protocol in this old data mechanism that Microsoft has, this is not there. People are looking for all kinds of interfaces, this is all the lessons we learned from SOA over the last years. There isn’t a single SOA. We did that. We have 3,000 enterprise services. But those make it possible for us to connect and extend the processes. What about UIs? What about master data? What about lifecycle management? So, the Gateway, think of it as a protocol adapter, that you can attach to a legacy system and have it speak to the world outside. SearchSAP.com: What of the “new horizon” products are you using at SAP? Sikka: We are using every one of them. SAP is the first customer of Carbon Impact, the first customer of HANA and the first customer of Duet. This was a commitment that I made, when I became a board member, that all our innovations that I build will be adopted at SAP first. This was not always the case, by the way.